BMW gives new cosmetic upgrades to the M850i xDrive Coupe First Edition, which is set for a limited run. 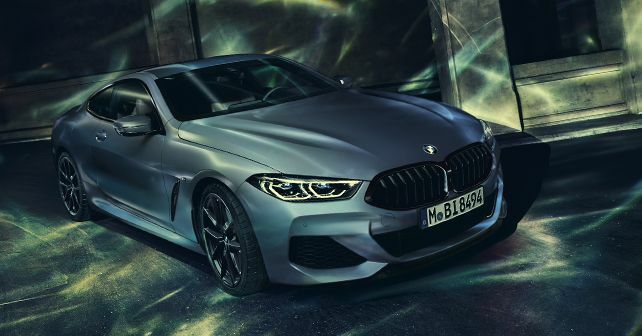 The BMW M850i xDrive Coupe First Edition has been revealed with cosmetic upgrades. The First Edition of the M850i will be launched later this spring and will see a limited production run of 400 units. The exterior of the First Edition model will feature blacked-out accents, like the side-window surrounds, front kidney grille and frame, air intakes on the front bumper and the tailpipe trims. The body will come with a new colour – Frozen Barcelona Blue metallic, which will feature on a BMW for the first time. The car will sit on 20-inch blacked out alloy wheels. An M Carbon roof and an M Carbon exterior package will be offered as an option as well. Step inside the cabin, and you’ll be welcomed with full Merino leather upholstery, finished in contrasting colours – Night Blue and Ivory White. The steering wheel is also wrapped in leather, while the roofline is finished in Alcantara in Night Blue colour. The centre console has a Piano black finish touch etched with the model’s production number and lettering – ‘First Edition 1/400’. The cabin is also equipped with a Bowers & Wilkins Diamond Surround Sound System, while the start/stop button, the iDrive Controller, the volume control and the illuminated gearshift lever are made from Crafted Clarity glass. At its heart, the BMW M850i xDrive Coupe features a 4.4-litre, twinpower turbo V8 engine that develops 523bhp and 750Nm of torque. All of which is channelled to the all-wheel-drive system through an 8-speed automatic gearbox. BMW will manufacture the M850i at their production facility in Dingolfing in limited numbers between April and June 2019.